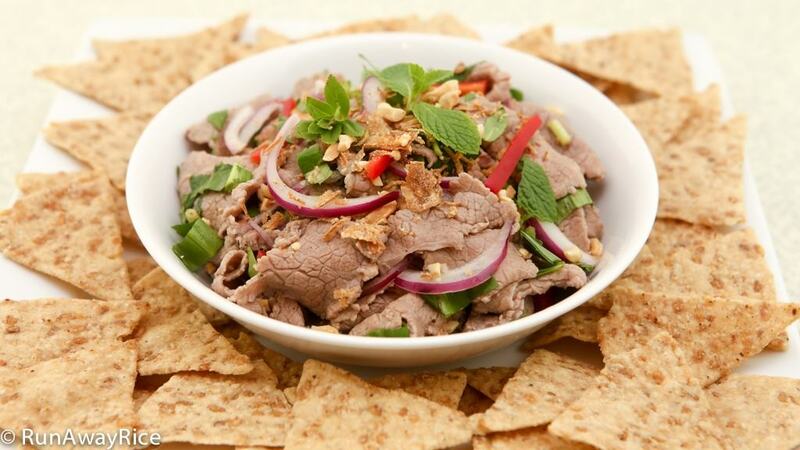 Flavorful and refreshing, this tasty Rare Beef in Lime Juice Salad is the perfect nom nom food. The minimally cooked beef is tender and succulent. The lime juice is fresh and distinct but not at all overwhelming and the fragrant assorted herbs are what pulls this entire dish together. Serve atop sesame rice crackers, rice chips or tortilla chips, this dish makes one amazing appetizer! Enjoy! Choose a tender cut of beef such as tenderloin, eye of round or filet mignon. Slice against the grain and this will ensure the meat is tender. If you find the beef difficult to slice thinly, freeze the beef slightly and this will make it easier to slice. The pineapple juice serves a dual purpose, it’s used to cook the beef minimally and to add some sweetness. If you don’t have pineapple juice, use water but you may want to add a bit more sugar when making the lime juice marinade. Cook the beef in the pineapple juice depending on how rare you like it but not more than 15 seconds. Keep in mind the lime juice will cook the beef the rest of the way. You’ll notice that I transfer the beef to a new clean bowl twice and leave the residual bloody liquid behind. This is my preference. If you don’t mind the liquid, just leave it. The acid in the lime juice will cook everything. If you enjoyed this recipe, you may also like: Baby Clams and Basil Appetizer (Hen Xao). Thinly slice the beef about 1/8-inch thick, cutting across the grain. Pour the pineapple juice into a small saucepan and set the heat to High. As soon as the juice starts to boil, turn down the heat to Medium. Please a strainer over the saucepan and into the pineapple juice. Take some of the sliced beef and dip into the hot pineapple juice. Swirl the beef in the juice for 5 seconds. Drain well and transfer the beef to a clean bowl. Continue until all the sliced beef is dipped. Transfer just the beef and not the liquid into a new clean bowl. Juice the limes and then combine with the 2 Tbsp sugar and fish sauce to make the marinade. Pour the marinade over the beef and mix well making sure all pieces are coated with the sauce. Cover the bowl and refrigerate while continuing with the next steps. Cut the red onion into thin slices and then separate into strings. Add the 1 Tbsp sugar and rice vinegar. Toss together and set aside for now. Remove the seeds from the jalapenos and cut the pepper into thin slivers. Wash and trim the fresh herbs. Coarsely chop all the herbs. Break the sesame rice crackers into small pieces. Place a few pieces into the microwave and cook on High for 1 minute. Remove and allow to cool. Continue cooking the remaining pieces. Transfer the marinated beef into a clean bowl. Add the seasoned red onions, red jalapenos, ground black pepper and toss together well. Add the chopped herbs and lightly toss. To serve, plate the salad alongside the sesame rice crackers. Top the salad with the crushed roasted peanuts and fried onions. 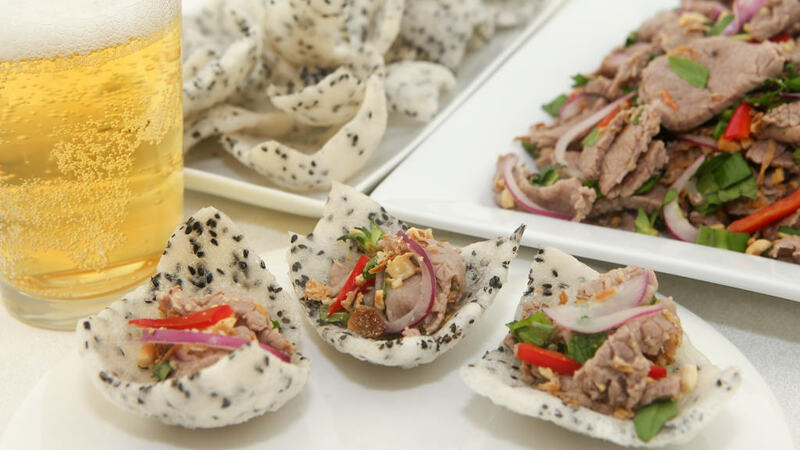 Pile the Rare Beef in Lime Juice Salad on top of the rice crackers and enjoy with your favorite cold beverage. Bon Appetit! Fish Sauce Dipping Sauce goes great with this recipe for added flavor and zing! Hi. At serving time is the meat supposed to be refrigerator cold temperature, slightly lower than room temperature, room temperature, slightly above room temperature, warm, or hot? The beef anywhere from room temperature to chilled. It’s more of a refreshing dish rather than something hot and hearty. Hope that helps.